....just. Its 12:30pm and I am waiting for the washing to finish so I can put the clothes in the dryer before I go to bed. 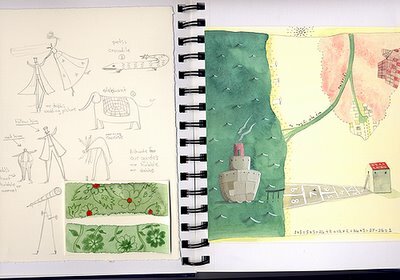 Thought I'd write a little here and add another spread from my sketchbook. My mum is getting better so I am a little less anxious now...the doctors need to do more tests so she can't leave yet. She is smiling and talking just as she used to and that makes me feel that everything is going to be alright. Of course you are not selfish hun, everybody needs some 'me time'. From what you have written you have been a tower of strength. Your sketch books are lovely! Do you paint right in them? (Coming in as 'Echo' as usual). If you don't find a refuge you won't be able to be strong for your mum. I think escaping to your sketchbook is one of the best things you can do, to stay as the Maya she knows and loves. You may even find that drawing under such tense circumstances produces new ideas and/or better work.